Posted By:Unknown | At:12:15 AM Be the first to comment! The 2nd night of the Democratic Convention was pretty lackluster for the most part, but there were some shining stars that graced the stage. One of those stars was Rep. Emanuel Cleaver who gave one of the speeches of the night. After he was done speaking, I felt like marching! CHARLOTTE, N.C. -- Rep. Emanuel Cleaver (D-Mo. 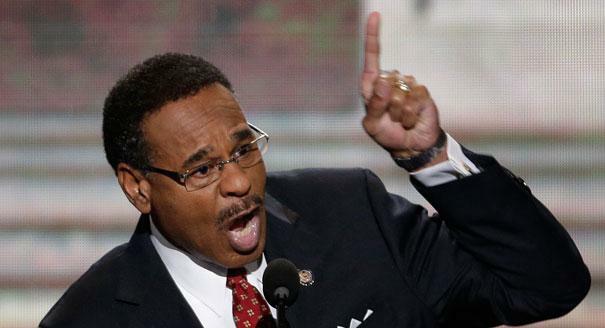 ), chairman of the Congressional Black Caucus, went off-script and fired up the crowd at the Democratic National Convention on Wednesday, using his oratorical skills as a United Methodist pastor to urge the crowd to help reelect President Barack Obama. In one of his most well-received moments, Cleaver passionately defended the Democratic Party and its ideals. Cleaver also invoked hope, a theme that was central to Obama's 2008 campaign. "There is something essential in the human spirit that searches for hope. We are driven by hope," said Cleaver. "President Barack Obama has been lampooned for speaking of hope; hope for a better America. I want to encourage our president and all of us to continue to hope for an America that remembers, recognizes, and fervently protects its greatness." Cleaver then improvised, again, in one of the highest points of his speech. "Yes, Mr. President, hope on. Continue to hope, Mr. President," he said, to rousing ovations and applause. "No matter what, Mr. President, you continue to hope! As long as the God of Abraham, Isaac and Jacob sits on the throne of grace, hope on! Hope on! Hope on! We are people of hope, Mr. President! Hope on! Hope on! When everything else is gone, hope on!" Later in his speech, Cleaver got convention-goers in the Time Warner Center Arena marching, when he told the Democratic audience to get out the vote for Obama in November. "Hope inspires me to believe that any day now, we will catch up to the ideals put forth by our nation's founding fathers. ... It is our hope and faith that reminds us to pray and also affirms that we must move our feet. It is our hope that tells us our latter days will be better than our former. It is our hope that instructs us to march on!" said Cleaver, marching in place. "And march on! And march on, means marching through our communities and to make sure everyone is registered and ready to vote."